The Community Creative Jam, also known as CCJam, is a family-friendly open stage for all creative disciplines, levels and ages. 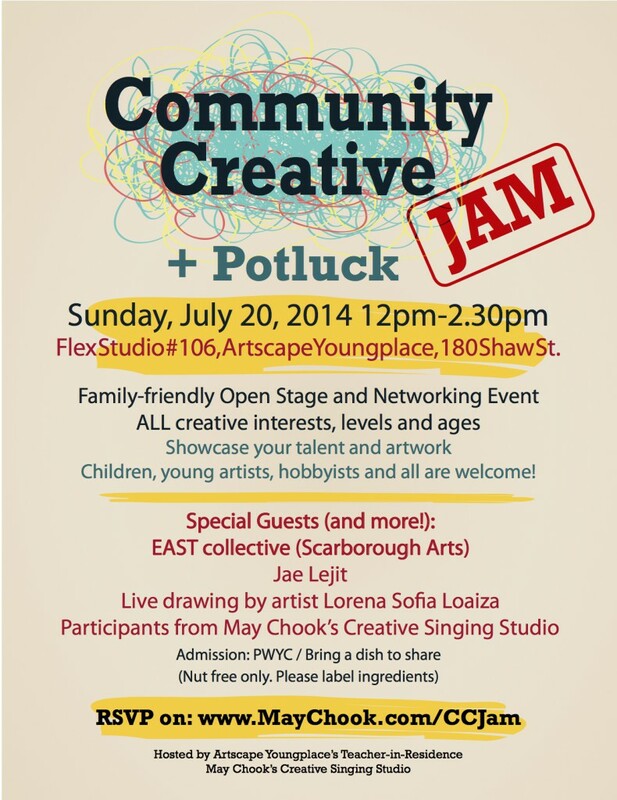 Yes we mean ALL – including children’s art and family craft.Music improvisation is highly encouraged! This is a positive space to showcase your creative side regardless you make art for a living or for leisure, because everyone is creative! Bring a song you wrote, bring your laptop to show photos you took with your new camera, show us a film you made, tell us you like to create new recipes, show us your beautiful doodles or painting, tell us a story. **Please be advised that there is no sound technician at the venue. Keeping things simple is highly encouraged. If you are bringing a bigger-than-2-piece band, you are encouraged to notify organizer in advance. POTLUCK STYLE! Please bring a dish to share if you are able to (nut free and please label ingredients). Food is a form of art.